Ol' Backwoods just finished a book that I have been avoiding since my teen years, a book, I supposed, so utterly despondent in its outlook, so stolid in its prediction of failure of civilization, that it would cast its pall of darkness over me, without recovery. Earth Abides by George R. Stewart is one of the most important, one of the more comforting, and one of the more hopeful books I have ever read. Surprised? Yeah, so am I. What could an atheist Berkeley professor write that should impress a backwoods Christian engineer so much? As you will see, Stewart used The End of The World As We Know It to reinforce lessons that I, that is, WE ought to have learned before. 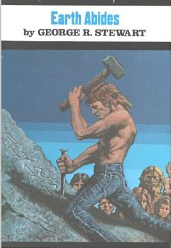 The image at right represents the protagonist Isherwood Williams ("Ish", to his Tribe, both nickname and title), wielding his sacred Hammer, carving into rock the Number of the Year since the Great Disaster, in which all of the world but the few Old Ones died from a deadly plague that swept the world in mere weeks. Right after the Disaster, Ish drove his car across America from one end to the other and back, following The Mother Road, old Route 66, searching for survivors. He found few. Most of the few dozen that were left were insane with normalcy bias following the Disaster. The couple in New York City that sat around playing phonograph records and drinking expensive but warm mixed drinks. The crazy "prophet" in LA that started a white-robed cult of doom. Some were better off, but strange to Ish the intellectual: the African-American tribe in Arkansas who lived off their garden, livestock and land, but who spoke a nearly-incomprehensible patois. These were the Last Americans. In the fullness of time, Ish became the patriarch of the Tribe of the Golden Gate Bridge, which numbered in the hundreds by the end of his days, sometime after the Year 42, in which Ish and the Tribe stopped hammering the Year into the Rock. Along with Ish's wife Emma, George and his wife Maurine, Ezra and his two wives Molly and Jean, Ish began to re-populate the Earth which Abides even after man falls. Ish taught his many great-grandchildren the way of the Bow and Arrow after the great stores of rifle ammunition from the warehouses began to be unreliable. He taught them to make dog-driven carts after the last of the gasoline, tires, and spark plugs gave out. But other than poor Joey who died in childhood, Ish could never get any of his children, grandchildren, or great-grandchildren to learn to read, write, or do simple arithmetic. They just had no interest. Ish constantly worried about the ramifications of them not learning, and about much more besides. In this, Ol' Backwoods identifies with Ish. 'Til her dying day, Ish's wife Emma reminded Ish not to worry so much about whether this or that system of support would break down (they all did eventually), whether this or that disaster would befall them (many did anyway), or whether the children and their children would learn enough primitive skills to survive on their own without depending on the now-rotting leavings of the long-dead civilization (they did). Emma's approach was to live life and not worry about it; she would face death or danger with courage when necessary, but above all else, to live. Even in death, Emma gave courage to the Tribe. But the Tribe lived on. They hunted, grew food, laughed, cried, loved, had children and more children. They defended themselves from wild animals, sought refuge from the devastation of earthquakes and wildfires, and carried water after the ancient water pipes rusted out and no more water came from the faucet. They made fire with the bow drill, after the last of the matches were gone. The Tribe lived on. In time, they merged with other tribes, gave each other immunity from diseases, and shared practical knowledge and ancient traditions alike. They told stories of the Old Ones, they who had built the houses, the buildings, and the bridges. They told of a time of magic light, and magic music, and of those who knew how to read the Books in the Great Library. These Old Ones were the Americans, and they had been great before the fall. Ish's children did not consider themselves Americans. And truly, they were only American by geography. As far as the Tribe knew, Ish was The Last American. Talking with my own children, who have now become adults, I share some of the worries that Ish had. Had the children learned enough to make it in the great wide world? My son is not a reader, as his father is, and this worries me. My daughter is helpless when it comes to fixing anything for herself. What about these and all the things my children do not seem to grasp; could they make it in the world without them? Combine this microcosm of my children with all that is happening to my country, and perhaps we have something approaching a trend. In a way, I feel as though my generation, Gen X, are also the Last Americans. Not precisely in the way Ish was in "Earth Abides"-- no, we have not (yet) had a civilization-killing event that left only a handful out of hundreds of millions. Our changes are not sudden and abrupt as in "Earth Abides", but the change is just as relentless, far beyond the mere "fundamental transformation" that this Present, er, President spoke of. Much more, more than we even can guess from our present perspective. The kids of my son's generation are almost as different from Gen X as the Tribe were from Ish. They are more inwardly-focused but paradoxically, also more relationship-focused. They are concerned more about what they are doing with their friends than making their mark in the world. Ambition is almost a thing of the past. As the Last Americans of Gen X become grey and frail, and then go to the grave, the Tribes will go on, content with what they have, not asking for a bigger place in the world. As one of Ish's great-grandsons said in the closing pages of the book, "Yes, I am happy. Things are as they are, and I am part of them." Command those who are rich in this present world not to be arrogant nor to put their hope in wealth, which is so uncertain, but to put their hope in God, who richly provides us with everything for our enjoyment. Command them to do good, to be rich in good deeds, and to be generous and willing to share. In this way they will lay up treasure for themselves as a firm foundation for the coming age, so that they may take hold of the life that is truly life. And now these three abide: faith, hope, and love; but the greatest of these is love. A timeless classic for me. I first read this book about 1970 and have reread it several times since. A few years ago I bought several copies and gave them as Christmas presents to those closest to me. People get ready, there's a train a comin'. I disliked the book. It has an air of defeatism and surrender to it. The survivors adapted to new realities but I wanted to kick them when they let the door or window or roof of the library go unrepaired as though there was nothing of value in the learning of the past. When gas went bad or tires rotted it was just, "Oh well," rather than anyone saying "How can we keep some of this going?" Now for a decent post-apocalyptic novel I recommend The Dog Stars (2013), by Peter Heller. The writing is a bit on the dreamy, poetic side but the underlying yarn is a good one with some good stuff about light aviation. Let's get real here. There really is no such thing as a bad post-apocalyptic novel. Riddle This: Where Does It Lead? Running Out Of Amendments to Violate, I Guess?